The cost of the project has been estimated at about four million rupees, CEB sources said. The project will be completed in two months' time and it would be declared open by the Minister of Power and Energy, Mr.Karu Jayasuriya, by the end of November, said the Deputy General Manager of the CEB Mr.P.S.Ranasinghe Monday morning after unveiling the name board of the project. Mr.Tilak speaking at the event said that a bright future is ahead for the people of Raalkuli with the commissioning of the new electricity supply project in two months time. "The development of a village is dependent on motorable roads and electricity. If both basic needs are fulfilled, the people of a village could stabilize their economy by launching self-employment projects," he said. Trincomalee SLMM head Mr.Abdel Burkan said that all parties concerned are working for the future development of the lovely children present at the occasion. SLMM has been working for harmony among various communities in the province through the process of reconciliation and normalization, he said. 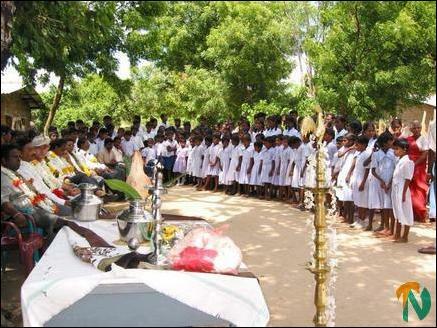 A section of students of Raalkuli government Tamil school are seen in front of the guests. The Deputy General Manager of the CEB, Mr. Ranasinghe, said he was glad to attend this function as Minister Mr.Karu Jayasuriya has shown keen interest in providing electricity to this village. 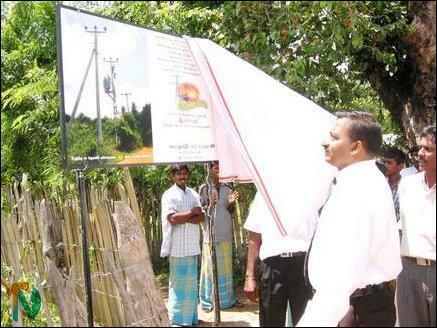 Villagers would get electricity by the end of November, he said amid applause from villagers. The main pylon of the CEB, which supplies electricity to several villages in the Muttur division including Muttur town, is located in Raalkuli. However, the Raalkuli village has not been supplied with electricity. Several requests made by the people of Ralkuli to the CEB that electricity should be supplied to their village went unheeded until recently. The CEB officials sought the assistance of the Sri Lanka Monitoring Mission when Raalkuli villagers were adamant in their stand, sources said. Thereafter, the SLMM had started its facilitation process to bring the parties concerned to an agreement. A village leader said the SLMM had kept its promise that it would see that the implementation of an electricity supply scheme for the village commences in October. Hence, the CEB officials from Anuradhapura in the northcentral province arrived in Raalkuli Monday to start the construction of electricity supply project, sources said. 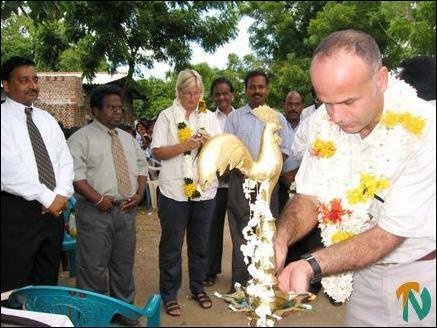 The LTTE's Trincomalee district political head, Mr.Tilak, is seen lighting the traditional oil lamp. The SLMM's Trincomalee head, Mr.Abdel Burkan, lighting the traditional oil lamp at the inaugural function of the project. CEB's North Central Deputy General manager, Mr.Ranasinghe, unveils the name board of the Raalkuli electricity supply project.